Plugins add functionality to build solutions to meet your exact requirements. Send us an email outlining your application/requirement and we will respond with pricing and a pre-configured demo of the required plugins. For a fuller explanation of the plugin options click here. FileName Generator - Automatically generate the PDF file name based on date, increment, barcode and data entered using the Document Indexing plugin. BarCode Reader - Detects a barcode on the scanned page and assigns the barcode value to the PDF name. OCR Module - Create searchable PDFs for submission to a document management system. Batch Scanning - Each page of a batch becomes a single PDF. Can also be configured to auto-detect document separators i.e. multi-page documents can be scanned together as a single batch. Can be used in conjunction with the filename generator and barcode reader to automate file naming. Document Indexing - Allows user to enter indexing and keyword information for submission to a document management system. C# DynaCode - Run custom C# or VB Net code triggered by events in the scaning process. Can be used for database updates, auto email, ftp transfers, processing of text returned by the OCR engine, etc. LogFile Generator - Creates a csv log file containing the details (file name, file path, page count, etc.) of the pages scanned. Document Selector - Create and maintain documents profiles for your different document types. Twain Settings - Create and maintain default scanner profiles for different document types. Oracle® e-Business suite plugin - This plugin allows you to convert supplier invoices into PDFs and automaically attach each PDF to the correct transaction in the bought ledger. SMTP Email Interface - Automate the email transmission of a copy of the PDF, can be configured to run silently. Watermarking - This plugin allows you to stamp the PDF with your own custom watermark. We will be pleased to consider developing a plug-in to meet your specific requirement. Why not contact us with an outline of your requirements? The home user version scans only a page at a time and is ideal for use with a flatbed scanner or multi-function device. It is not intended for use by the business user. Please note that multi-page PDFs can be created with this version. Licences are issued on a 'per seat' basis. Licences can be transferred on payment of an administration fee. Corporate licence details are available on request. Please contact us for details. We endeavour to respond with your licence number within the shortest time possible but please note that international time differences, weekends and UK public holidays may sometimes cause a delay. We will be pleased to consider the modification or tailoring of Scan to PDF to meet your specific requirements. Please contact us with an outline of your requirement and we will respond with an indication of cost and timescale. We also offer a branding service such that ScanToPDF can be seemlessly incorporated into third party products. The branding service includes changing the product name and logos to reflect your product's identity. Contact us for further information. Batch scanning option - one PDF per page. Batch scanning option - multiple PDFs from one scan batch. Auto-Generate filename - increment, barcode, datestamp. With your co-operation we will be pleased to consider translating the product into other languages. Image capture devices (scanners, cameras, etc.) must be Twain or WIA compatible. 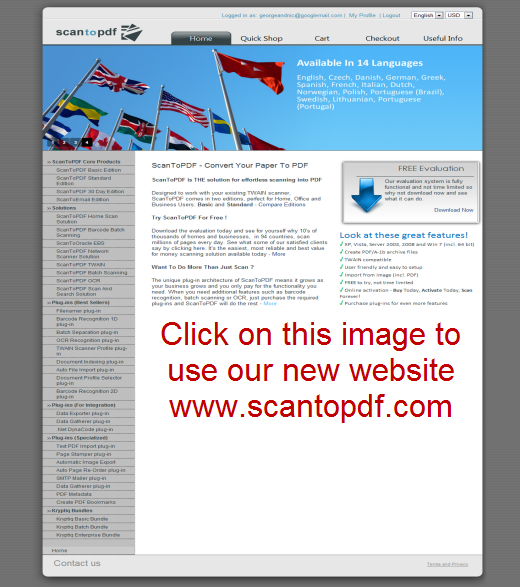 pdfpath = "//server/works order pdfs/" & pdfname & ".pdf"
progpath = "C:\Program Files\O Imaging Corporation\ScanToPDF\scantopdf.exe"
progswitches = " /autoscan /terminateaftersave /pdfpath=""" & pdfpath & """"
Integration enables Scan To PDF to automatically attach a PDF to a record in your database. For example a supplier's invoice to the bought ledger record, a CV to a candidates record, a POD to a despatch record, etc. Please feel free to contact us with details of your requirements.